The artists of the historical paintings by the Brotherhood of St. Luke that were commissioned for the Polish Pavilion at the 1939 New York World's Fair were eleven Poles who were associated with one another through the Academy of Fine Arts in Warsaw. Tadeusz Pruszkowski (1888-1942) was a member of "Rhythm" (co-founded in 1921 by Eugene Zak) until he formed his own group of artists in 1925 with his pupils from the Academy of Fine Arts in Warsaw. The original members were Eliasz Kanarek, Aleksander Jedrzejewski, Antoni Michalak, Jan Wydra, Edward Kokoszko, Boleslaw Cybis, Jan Zamoyski, Jan Gotard, Czeslaw Wdowiszewski. Modeled after the medieval guild, the fellowship works collaboratively under a master. Pruszkowski’s talent as an artist notwithstanding, it was also his personality that drove the success of his teaching and the work of the Brotherhood of St. Luke. He was gregarious and encouraging. His studio’s atmosphere and its outdoor, costumed ceremonies of “initiation” and “emancipation,” while serious is their artist intent, were fun-filled events led by the master’s grand sense of humor (Zachete 2012, 6). This grant of liberation from the strictures of traditional approaches to artistic creation was made with the requirement that the result was better. Pruszkowski’s big personality is evident when you find his visage in some of the seven historical paintings. Pruszkowski’s home at Kazimierz Dolny on the Vistula River, outside of Warsaw, served as the studio and retreat for this project. 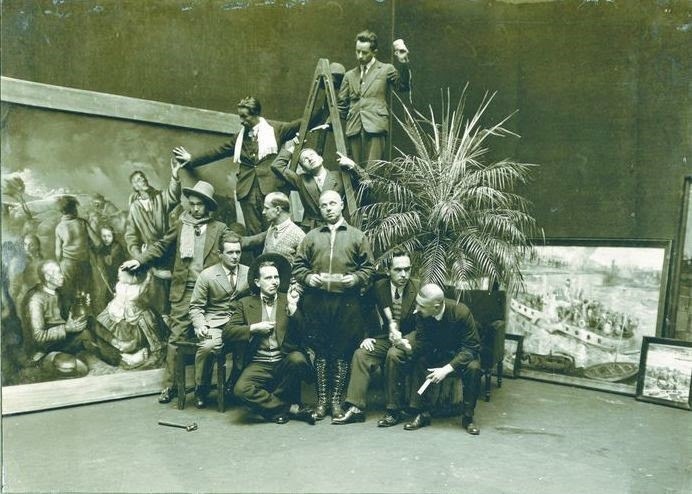 Pruszkowski & artists group photo from the 1920s: Pruszkowski is standing front and center, with Cybis on the left making a facial expression. Kanarek is at far left, then Jedrzejewski. In 1938, the group now composed of eleven artists was commissioned to paint a series of paintings to adorn the hall of honor in the Polish Pavilion at the 1939 World’s Fair. Portraiture, architecture, landscapes, sketches, and color mixing were collaboratively assigned according to achieve a uniform style called for by the commissioners (Piotrowska 1947, 111). The artists’ aim was for historical accuracy. Using primary research materials and coinage, the art depicts the true faces of the participants, as well as the places, fabrics, and artifacts (de Ropp). Their style is that of medieval art in their use of tempera and in their achievement of accurate illustration for clarity to teach the audience and to be decorative (Piotrowska 1947, 114). It has been said by many that there is no history of Poland without the history of Polish Jews. In 1939 at the outbreak of World War II the Jewish population of Poland was 3.5 million, the largest in the world. The story is that Pruszkowski, a Jew, was identified in Warsaw to the Nazis through his tailor, by the suits he wore (Pruszkowski 1996). He was imprisoned in Dachau and was shot by the Gestapo in 1942 in an escape attempt (Kossowska 2002). Jan Gotard suffered a similar fate. His town of Kazimierz remains today as an artist’s town and has a museum of Jewish artifacts. Boleslaw Cybis (1895–1957) was a painter of quite renown, as was his wife Marja Tym Cybis. Eventually, as a professor at the Academy of Fine Arts in Warsaw, he became allied with fellow teacher Tadeusz Pruszkowski. He and his wife traveled to the United States when the Polish exhibits were sent to New York in 1939 to paint a series of murals at the Polish Pavilion at the 1939 New York World's Fair. Unable to return to his homeland after the outbreak of World War II, Cybis chose to remain in America where he founded Cybis Porcelain, America's oldest existing art porcelain studio. Renowned for its porcelain sculptures, his company’s works are in major collections, including the Smithsonian Institution, Buckingham Palace, the Vatican, and the White House. 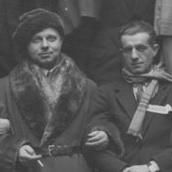 Eliasz Kanarek (1901–69) Accompanied Stefan de Ropp, Commissioner General of the Polish Pavilion of the 1939 New York World’s Fair (NYWF), aboard the S.S. Batory carrying the exhibits for the Pavilion and served as a mural painter for the NYWF. He remained in the USA. De Ropp, Stefan K. “History of the Series of Polish Paintings in the Le Moyne College Library.” Syracuse, NY: Le Moyne College Archives, 1958. Typescript. Detroit Institute of Arts. Polish Paintings, a Loan Exhibition: June 1st to July 1st, 1945. [Arranged by and with an introduction by Boleslaw Mastai] Detroit: The Detroit institute of arts, 1945. Piotrowska, Irena. The Art of Poland. New York: The Philosophical Library, 1947. Pruszkowski, Krystof. Personal conversation with Inga H. Barnello and James J. Simonis, Syracuse, NY, 1996. Sendejewicz-Michalak, Magda. “’Wybudowal dom wysoko’ Tadeusz Pruszkowski i jego zwiazki z Kazimierzem.” Wkazimierzudolnym. http://www.wkazimierzudolnym.pl/tadeusz-pruszkowski-i-jego-zwiazki-z-kazimierzem.html 2002.